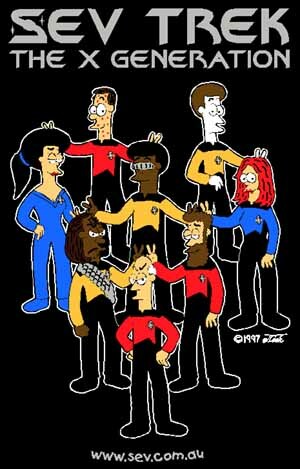 The X Generation T-shirt features a 6-colour design of the crew of Sev Trek: The X Generation, acting in a less than distinguished fashion. The colours include a metallic silver used in the Sev Trek heading, comm badges, Gaudy's visor and Barf's sash. The silver has a very shiny, sparkly effect that looks striking on the black shirt.